SINGAPORE - South-east Asia's largest bank DBS has flagged heightened macroeconomic uncertainty for the second half of the year, with its chief fretting over the spillover effects from the new wave of US-China trade tensions. In a slide presentation on DBS' results to the media on Thursday (Aug 2) morning, CEO Piyush Gupta said that while the impact of the first wave of rising US-China trade tensions has been benign, the second phase is "uncertain". He added that he is concerned over the possibility of "spillover effects" as it could wind up as a confidence issue, which could hit equity markets, yield curves and credit spreads. Mr Gupta also said a DBS analysis showed that there was zero impact from the United States' first set of tariffs on US$50 billion of Chinese goods. But for the latest threat to slap tariffs on US$200 billion of Chinese imports, including on consumer goods like vacuum cleaners and washing machines, it is not clear how much that will impact the supply chain, he added. Closer to home, Mr Gupta also said he expects some impact on property loan growth, with the recently announced cooling measures for the Singapore property market. DBS has a Singapore housing loan market share of 31 per cent. This comes as the bank reported an 18 per cent gain in net profit for the second quarter that missed estimates on the street, as stronger net interest income was offset in part by a fall in non-interest income on lower trading income. Net profit for the three months ended June 30, 2018 stood at $1.33 billion, compared to $1.13 billion posted in the year-ago period, and was driven by higher net interest income and fee income. This translated to an annualised earnings per share of $2.10, up from $1.76. The results missed estimates against a $1.44 billion average forecast in a Bloomberg survey of six analysts. DBS shares fell 2.56 per cent in morning trading, down 69 cents to $26.25 as at 10.17am, amid broader market weakness. UOB shares were down 2.4 per cent to $26.60, while OCBC Bank was 2.2 per cent lower at $11.34. 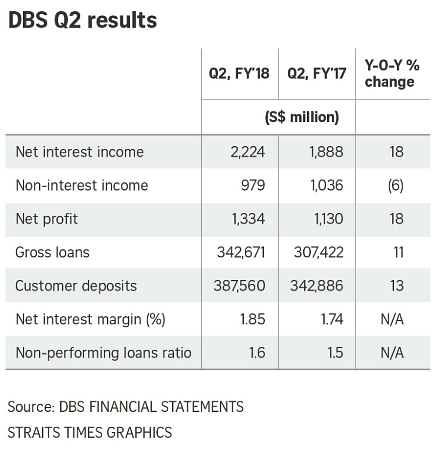 DBS said net interest income rose 18 per cent to $2.22 billion, with loans growing 12 per cent and net interest margin (NIM) increasing by 11 basis points to 1.85 per cent. The bank has cut its loan growth outlook for 2018 to 6-7 per cent from 8 per cent, on the back of expectations of lower trade loans. But it expects a stronger NIM pick-up, bringing it higher by one to two basis points above previous guidance of 1.85 per cent for the full year. Its non-performing loan ratio stood at 1.6 per cent, lifted from 1.5 per cent a year ago. Non-interest income fell 6 per cent to $979 million. Trading income declined 23 per cent to $227 million, reflecting "trading headwinds" from a flatter yield curve and wider credit spreads. A lower gain from investment securities also contributed to the decline in other non-interest income. The bank also reported its lowest recorded income from treasury markets, with income from that segment for the second quarter dropping 59 per cent from a year ago to $107 million. The bank said this was due to some "structural impact" from exchange trading and high frequency activities. Net fee income increased 11 per cent to $706 million, led by growth in wealth management and cards. Expenses rose 12 per cent to $1.42 billion, driven higher by costs tied to the acquisition of ANZ's wealth management and retail banking business in Singapore, Hong Kong, China, Taiwan and Indonesia. Excluding expenses tied to ANZ, expenses rose 5 per cent. DBS expects to maintain a cost-to-income ratio of 43 per cent this year. The bank has declared its first-half dividends at 60 cents, up from 33 cents a year ago as earlier guided.